Affordable Mason in Cherry Hill NJ excavating a brick wall down to the foundation because our customer was experiencing water leaking through the brick wall into their basement. 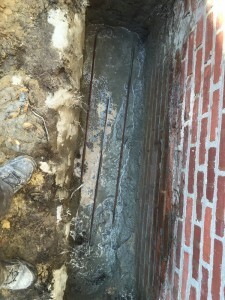 We removed about 5′ of dirt, and pour reinforced concrete, sealed the brick and the basement is dry again! Contact the Affordable Mason for a free estimate!